On a snow-covered rooftop in New York, Leonardo stands alone against a legion of Foot Soldiers. Leo fights valiantly against his foes, cutting dozens down, but their superior numbers eventually get the better of him and everything goes black. Suddenly, the sound of Raphael’s voice snaps Leo to his senses. It’s Christmas and he’s standing on the roof of April’s apartment building. Raph can tell what Leo is thinking about and reminds him that his defeat against the Foot wasn’t his fault; that his brothers should have been there for him. Leo assures Raph that no one failed and everything worked out in the end. His only regret is that he hadn’t been a better fighter at the time. Raph tells Leo not to go there and, before heading back inside to sing carols with Shadow, gives Leo a small present. Leo wishes Raph a Merry Christmas as he opens the gift, revealing a medal with the engraving, “You’re #1”. *For my money’s worth, I like to place this story immediately after “A Christmas Carol”. 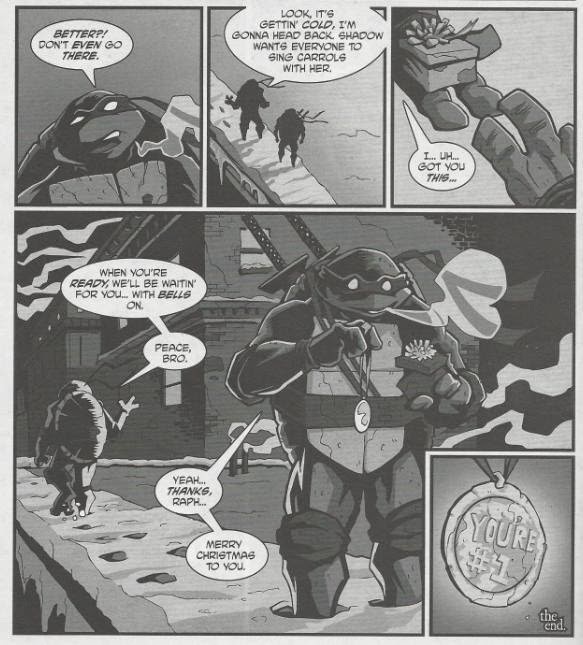 *The events Leo remembers occurred in Leonardo (microseries) #1 and TMNT (Vol. 1) #10. It’s always a pleasure to see the Turtles stop and reflect on some of the more meaningful events that have transpired in their lives. I’ve mentioned in other reviews how the Turtles live in a world where they can’t go to the grocery store without getting sucked into another dimension or attacked by zombies. Their lives are a nonstop string of bizarre adventures that fire in rapid succession, so naturally they wouldn’t pay much mind to most of them. Still, some events are so important to their history and ongoing narrative that they need to be reflected on instead of brushed off as "just another Tuesday", and the time Leo got trashed by a horde of Foot Soldiers and his entire family nearly got burned alive by the Shredder, resulting in their extended exile to Northampton is certainly one of them. Leonardo, being the fastidious perfectionist of the family would most certainly let the greatest defeat of his life haunt him, that’s for sure. I like to think of this story happening on the same Christmas Eve or maybe the following Christmas Day as the earlier story, “A Christmas Carol”. 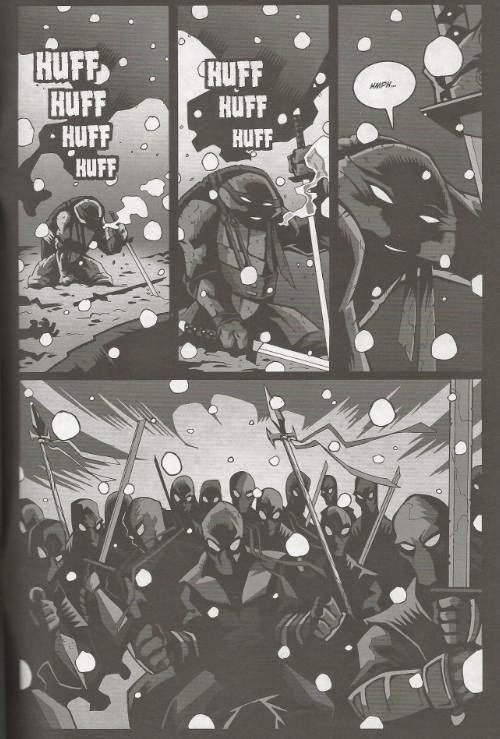 In that story, Raph also revisits the events of TMNT #10 (in a much more literal sense) and is seen pondering how close Leo came to death. Seeing him here, reassuring Leo that he did everything he could at the time, actually brings a nice bit of closure to that earlier tale, which was all about Raph learning a lesson from the Spirits of Christmas. Unfortunately, the gift he got for Leo is so ridiculously patronizing that I’d almost think it was a cruel joke. If one of your friends is struggling with clinical depression, would you go out and get them a t-shirt reading “I’m a Super Star!” on it and expect them to take you at face value? Chad Hurd’s pencils are rather good, if Berger’s panel layouts are a bit conventional. The toning is very dark, so you don’t really get a good look at any of Hurd’s detailing or what he’s capable of in that regard. Still, the story takes place after dark, so the lighting is appropriate. 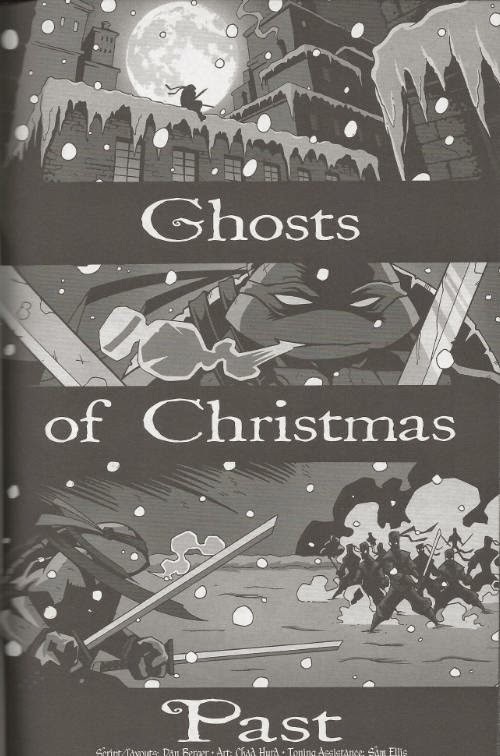 Anyhow, by themselves, I don’t think that “A Christmas Carol” and “Ghosts of Christmas Past” are exceptionally fantastic stories, but when you put them together they make for a rather effective story that sees two characters revisiting one of the worst moments of their lives in two very different ways and then coming together to console one another. Of course, this is just my opinion. I really don’t know, and highly doubt, Dan Berger conceived it as a sequel to “A Christmas Carol”. So looking at “Ghosts of Christmas Past” on its own, it’s a tad humdrum, and while the ending is sweet, the weird gift kind of sticks a knife in it. I have to disagree with the whole Raph statement. I thought that the "#1" gift is very strong, especially coming from Raph. Raphael has always been sort of 'jealous' that Leo is considered the best, because he really is trying to become a great Ninja. So, giving him the #1 medal is basically confirming that even he knows that Leonardo is the best ninja out there. He killed Shredder twice, he's the leader for a reason and Raph, despite giving him a hard time, is basically telling him that he agrees with these statements as facts and respects him, even though he doesn't always show it. It's something Raph could only do when Leo actually needed it. Overall, I thought it was a good story.